The CO and NO versions of this product are now obsolete and have been replaced by the Auto 2-2 and Auto 5-2 respectively. 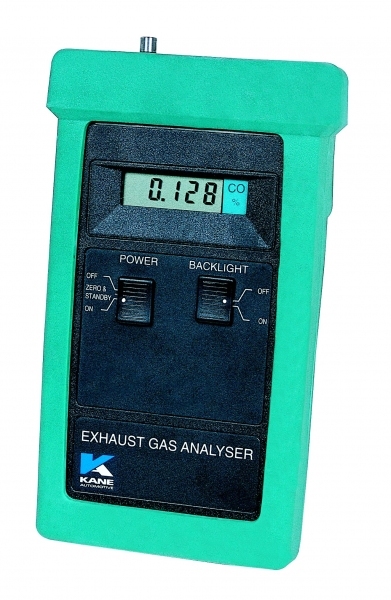 The Kane range of portable exhaust gas analysers (EGA80, EGA81 & SGA92) are designed to provide a cost effective alternative to more expensive and complex fixed systems. The Auto 1 single gas series measures NOx, CO or O2 individually using electro-chemical cells. This provides the workshop with a low cost way of adding the "5th" gas to an existing 4 gas analyser, in the case of NOx; or the benefit of CO analysis for tuning/ emission checking purposes (Auto 1-CO;) or establishing the existence/ location of air leaks with the Auto 1-O2. Exhaust emissions can be monitored in normal static conditions in the garage, or during road tests or while using a rolling road. Take the analyser to the vehicle, not the other way round! Kane International provides the automotive technician with an easy to use diagnostic tool to assist with fault finding on any vehicle. In test/repair situations this eliminates the need to tie up expensive equipment on unplanned tests. Measurements are taken direct from the exhaust pipe to confirm that the engine set up parameters are correct. This process highlights the correct operation of the catalytic converters and sophisticated engine management systems. Adjustments can be made and the effects on the exhaust gas concentrations can be quickly seen. With sensor life typically in excess of two years and minimal running costs, the EGA range offers a cost effective solution. Note: Always use a high temperature probe for road tests and for checking vehicles on rolling roads.